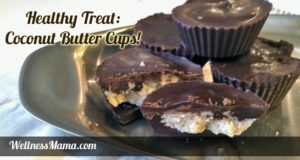 These coconut butter cups are similar to my coconut clusters, but slightly easier to make and without the coconut texture that many kids don’t like. They provide a lot of healthy fats and are a way to sneak some extra coconut into your kids’ diets. 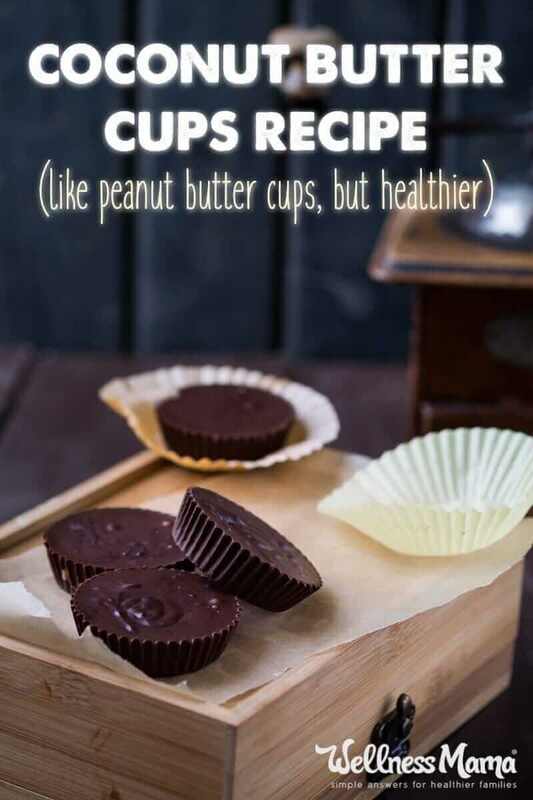 If you liked Reese’s cups in your pre real-food days (*ahem*) these are a good healthy substitute. They don’t taste exactly like Reese’s (no peanut butter or high fructose corn syrup) but are a good alternative. We also sometimes bring these to events where there will be treats for the kids so that they have a healthier choice. 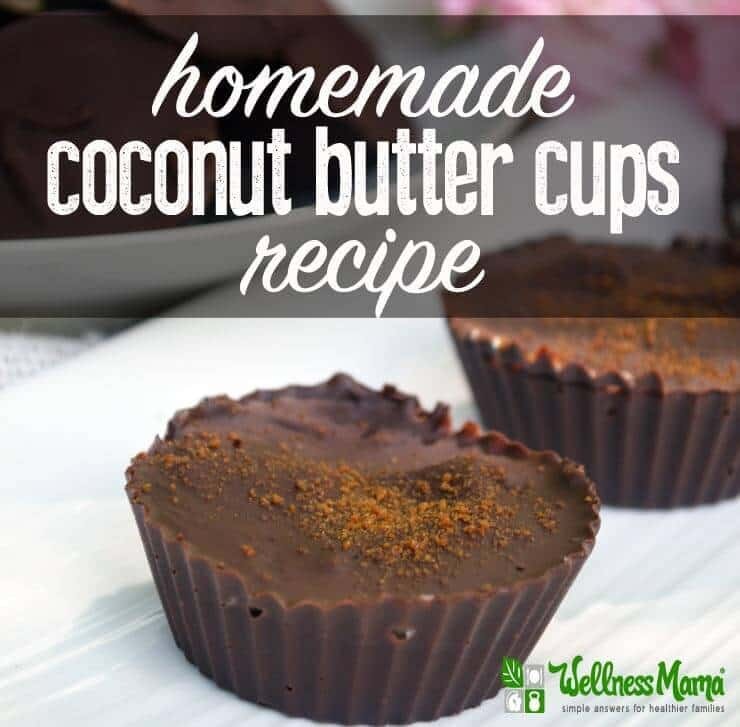 Coconut butter cups are similar to peanut butter cups, but without the high fructose corn syrup or peanut butter. 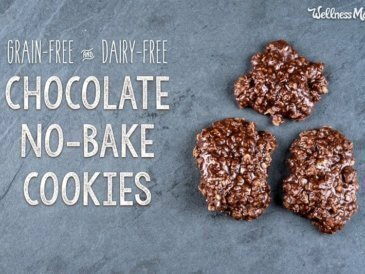 They are fun to make and a great, natural treat. In a blender or food processor, combine the shredded coconut, vanilla, 2 Tablespoons of the coconut oil, and the stevia extract and blend/pulse until thick and paste-like. It will eventually start to resemble the thickness of almond butter or coconut cream concentrate. Set aside. 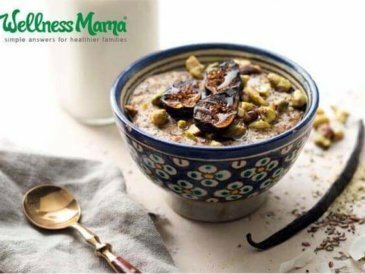 In a double boiler or bowl on top of a small pot of boiling water, melt the chocolate with the remaining 1 Tablespoon of coconut oil. When melted, remove from heat. Pour about 1 Tablespoon of the melted chocolate into the bottom of 12 muffin cups (silicon work best) and rotate the muffin cup to coat the sides (I haven't tried paper liners, but they might stick!). Make sure you only use about half of the chocolate mixture. Put the cups in the freezer to harden quickly once you have coated the bottom and sides of the muffin cups. When hardened, take each out and scoop out about 1 Tablespoon of the coconut mixture into each cup and press down gently with the back of the spoon to flatten. Cover the tops of the coconut mixture with more melted chocolate and put back into the freezer or refrigerator to harden. Once completely firm, remove from the muffin cups (will probably need to dip the tray into hot water if using metal muffin cups) and store in an airtight container. Fancy them up a bit by sprinkling with a little shredded coconut or chopped nuts while the top layer of chocolate is still melted. Do you love coconut? What is your favorite way to eat it? Share below!